We all arrived safely back in the US, along with our precious wine I got an email from Tanya yesterday saying that she was having a hard time focusing at work as she kept thinking about our trip to Spain and the beautiful vineyards! We had such a wonderful time, and we are so glad that we had you as our host. 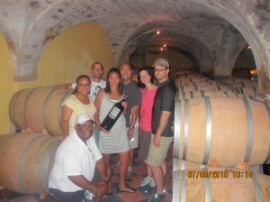 Not only were you so knowledgeable about the wines and the area, you were a lot of fun and great to hang out with. I have already raved to my friends about you and your tours. I am hosting wine dinner this weekend and hopefully Mike took some good tasting notes. We also received an email from Jesus…such a wonderful man. I hope you have some free time when you are out our way that we can get a chance to see you and take you out to dinner. In the meantime-have a great summer and please keep in touch!